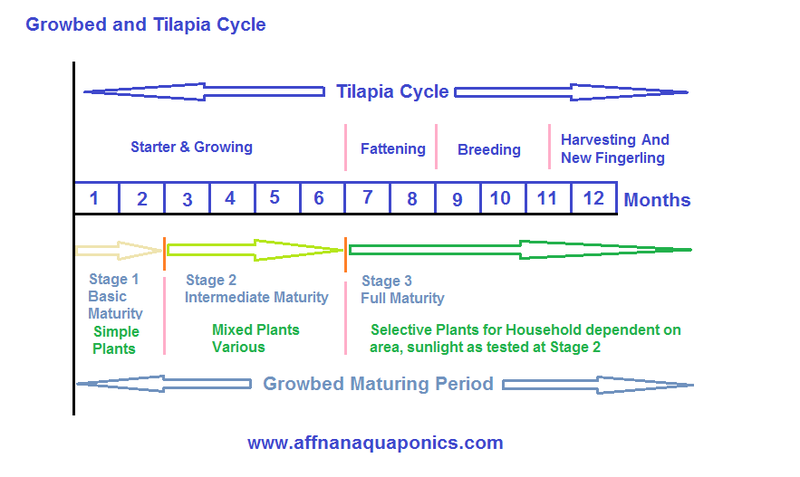 Affnan's Aquaponics: Growbed Period and Tilapia Cycle. 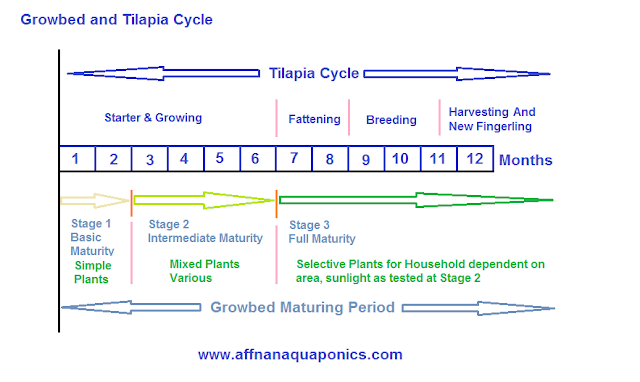 Growbed Period and Tilapia Cycle. I had been doing these for quite some times and decided to put it to paper, what I practiced in relation to Growbed Maturing Period and Tilapia Cycle. This is for backyard and not intended as a guide for commercial venture where they will need faster Tilapia Harvesting and Growbed Maturity. Above graphic representing the number of months in a year and at a location where sunshine is year round, no fertilizer or supplements except Iron in the form of few metal rods. Growbed bed maturity as most cases states at 6 to 8 weeks same as in normal aquarium, however in real situation this period can be longer depending on how well the water is controlled and other factor like aeration and sunlight exposure. At about 2 months there will be a sure sign of maturing. During this period its best to try out simple plants to keep Nitrate in check. Post Basic Maturity to roughly double the time needed as Stage 1. This is where bacteria and fish reaches an equilibrium and start to build up more and more nutrient toward sustaining full growth of plants and fish. During this period, try various plants to ensure suitability in term of location, climatic conditions and whether suitable for Aquaponics planting. This is at 6 months and onwards, this where system has reach its full potential and planting should be base on Stage 2 trial. Plants are grown to make it possible to harvest adequate quantity for household needs. 1 ~ 6 Months: Initial start of a system, fingerling are added and rear for 6 months with starter and grower feed. 7 ~ 8 Months : Fattening Period for Harvest, Normally Finisher are feed to these fishes. Tilapia can be harvested after 8 months as in backyard setup, but I usually done it at end of the year after about 10 months due to slower growth that I wanted. 8 ~ 10.5 Months : Select few breeder like 2 males and about 5 females and keep them separate, watch closely, they could breed after 1 months. Separate those fry once detected and grow them in separate area and return breeder to stock for harvest. 10.5 ~ 12 Months : Once fry large enough at about 2 inches fingerling, you can start harvest those big tilapia for dinner. Above are base on what I practice for household consumption and at a backyard environment. Do you breed your own tilapia? I just wanted to know if you have any experience breeding tilapia. I am new to aquaponics world. It seem like everyone is using tilapia for their system. It's a mix of both breed my own and get fresh stock from fish nurseries. Breeding tilapia is a simple process as long it's not for commercial intent. For own use, they breed easy and enough for self usage. I had Koi with Tilapia in my setup, so far there is no problem. Mintak share kedai ikan yang menjual benih tilapia secara runcit e.g. ~20-30 ekor. International Aquatik dah pindah pulak, biasa cari ikan di situ. SMK Muhibbah Sandakan Sabah - Aquaponics Project.